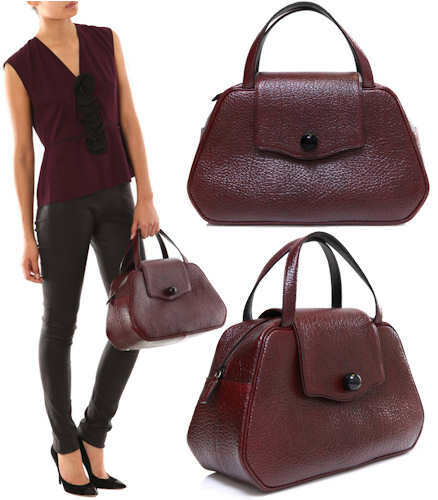 This Mulberry Greta Hobo is a plum bag made from grainy lambskin leather. It has an adjustable shoulder strap that has a gold-tone lobster clasp fastening – all the metal hardware on the Greta is coloured gold. Another striking feature of the bag are the two large luxurious leopard print tassels which attach to the bag via a D-ring. The Greta is a slouchy bag with a fold over top. All the golden studs with which it is embellished are branded. It has a stud fastening main compartment. Inside, there is one zip and one slip pocket and there is also a golden Mulberry fob and leather brand label. The bag is fully lined in branded fabric. 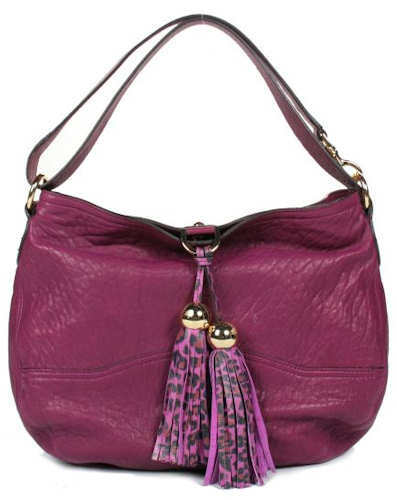 Style note: The rich plum colouring combined with the luxurious grainy lambskin leather and the opulent leopard print tassels make this the bag of choice for the women who likes classic, top quality styles yet has a sense of fun. This is a head turning bag that should be used and enjoyed by somebody who will truly appreciate its qualities. Wow! 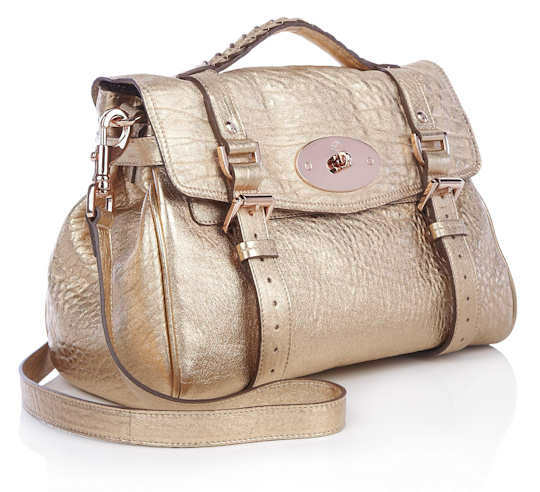 Look at the latest version of the popular Mulberry Alexa. This brand new classic has now been made from pink champagne metallic textured leather, teamed with rose gold hardware throughout. You may know already that the Alexa is a cross between the Mulberry men’s briefcase and the Mulberry Bayswater. But this bag is so far removed from anything remotely masculine! Mulberry Alexa signature features including postman’s turnlock fastening, branded hardware and rivets, two buckled straps with popper fastenings, a plaited top handle and detachable shoulder / cross body strap. Inside, the bag is lined in Mulberry tree signature fabric and trimmed in suede. There is a zip fastening pocket, oval leather Mulberry label and rose gold metal fob below; opposite there is a slip pocket. Note that the leather used will age, giving the bag a vintage appearance over time. Style note: I thought that I was a faithful girl. I have my Mulberry Oak Alexa and it is a lovely bag. But just look at the latest version of the Alexa in this grainy textured pink champagne metallic leather. It just oozes opulence. Just imagine carrying it and everyone looking at you, enviously, covetously. It feels like falling in love all over again.